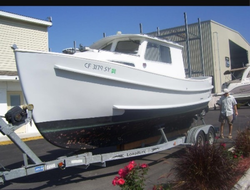 We are offering an high end quality of Fishing Boat to our clients. These uniquely designed boats are made by using high quality plastic fiber, steel and latest machines. In order to accomplish the varied requirements of our clients, these boats are offered in different shapes and colors. It is available at very cost effective prices, these are known for their swift and smooth run. Fishing Boat FRP/ GRP; Length 30 feet and Breadth 6.5 feet; Suitable for lambdi engine; OBM can be fitted. We offer a durable range of Fibreglass Fishing Boats. Once it is set up it does not require maintenance and has high resistance to diverse climate changes and harsh sun rays. Aimed at a prosperous growth in this domain, we are instrumental in offering an excellent quality range of FRP Fishing Boat. 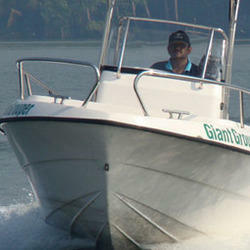 Our company holds vast experience in this domain and is involved in offering different leisure boats. Being one of the trusted firms in the industry, we are highly engaged in providing a unique range of Fishing Trawler Water Boat.